As most of you will be aware, the Pixelmon Server has been down for approximately 1 week now, which has caused some upset to our player base as I know how popular of a mod it was for you all. The reason the server is down is due to Pixelmon releasing a highly unstable version of their plugin, which we updated our server too. Upon updating, everything seemed relatively stable, however over time an error started to generate. This error kept on generating, up to the point it was creating 25 log entries per second. The Slap Gaming Pixelmon Server runs on a RAM Disk for increased performance. The negative to using a RAM disk is that if the disk ever gets full, it will be unable to write any new files, and will corrupt current data. This very scenario occurred for Slap due to this 25 log entries per second error. We have tried to resolve the issue, however it would seem that our server files all got corrupted, rendering our server and world map un-usable. Another unfortunate event that has recently occurred for SLAP is a significant drop in our player base and donations to the servers. Minecraft's global popularity is in decline, and many small-medium servers are being effected by this greatly, SLAP being one of them. Our player base has shrunk by over 50% in the past 6 months. We have also lost crucial voluntary staff from our Moderator and Admin teams, meaning greater strain has been put on the remaining voluntary staff members. Also, a lower player count has meant a significant decrease in donations from you all, meaning the servers donation goals are not being met. Because of this, we are struggling to support 2 active servers. This issue, along with the unfortunate events that have occurred with the Pixelmon Server has lead us to take the decision to remove the Pixelmon Server from the Slap Gaming Server Network. We will now focus all our time and efforts on supporting our main Survival, Creative, and Minigames Minecraft Server and aim to keep this running for the foreseeable future! This has not been an easy choice for us to make. Slap Gaming provides these servers for your entertainment, and I truly am sorry for the disappointment we will cause some of you for losing access to this server, but we simply cannot support it any more. The main server will stay up and running, but only if we have an active player base and people to support it! How can you keep our server running? Simply play on the server! Enjoy yourselves! Bring friends to play on SLAP! If we see an active player base it will give us the motivation to keep putting in hour upon hour of time and effort into this server! Our player base has shrunk significantly, and the only way to change that is if Everyone helps to get our numbers back to where they should be! We will also be changing the way donations work very soon due to Mojang's recent EULA changes! Nobody wants to see Slap Gaming disappear, but if things don't change this could happen! 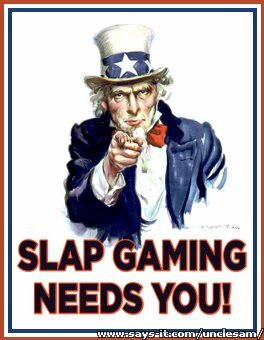 We need all of You to help us keep Slap Gaming alive! This community and these servers have been running for nearly 4 years, let's make sure Slap Gaming makes it to it's 5th Birthday and beyond! I truly am sorry that it has come to this, losing a server is something I never wanted to see happen, but unfortunately, it is what it has come too. I assure you I will do all I can to keep Slap Gaming going long in to the future, but I need all of you to help me out to achieve this goal! Let's keep the Slap Gaming Community going and get it back to where it should be! I hope you all understand, and once again, I'm sorry for it having to come to this. Q: Will people who donated on the Pixelmon Server receive any sort of compensation for their donations? A: This is currently in discussion and I am working out some way of providing compensation to you all, Refunds will not be given as donations are used to pay the server bills. Q: Will the Pixelmon map be available for download? A: I will see about downloading a non-corrupt backup and getting a map copy uploaded at some point, I just cannot arrange for this currently. Last edited by Jackster21; 13-08-2014 at 09:22 PM. Slap was the thrid server I came across, and the only one i've stayed in. I've made so many friends here and hold so many memories, that it would break my heart to see Slap go. If we all pull together and get the word of the Slap world out there, we can make it as great as it once was! Let's do this people! "Who wants a piece of me?" Should be easier to focus all the attention to one server than try to do one on a mod that is broken lol, what ever happened to all the trackmania/BattleField players? May want to start encouraging more of other games than "Lego the mmo" , main problem I have on the main server is I pretty much have everything, no need to go do anything because it's in one of my 100+ chests in my 30+ homes! Eh I'm going to regret saying this but maybe a server wipe is due, of bans and world. Would be better than watching it burn to the ground and debate weather you should grab a bucket of water or not :p.
I would like to know if it was ok for me to publicly advertise the server on server list thingies? Recently, I announced my quitting of the server, and gave everything I owned away, had all my wgs removed, and plots marked for deletion; But I simply cannot let this server go, being the first server I ever joined, and like sparkle, only one I have stayed with... And after reading this, I want to play SLAP all summer long. P.S. I will join the server once again and restart! although I do have obligations to fulfill as staff member of another close server. P.P.S. #ChubbysComingHome #Monday #LongLiveSlap! #OldMembersComeBack! #UpgradeServerPromotion! #GonnaStopNow! Last edited by chubbyking123; 16-08-2014 at 08:33 PM. Reason: #hashtag! I have recently left as well. It pains me to even think about the server vanishing because for a super long time, this was the only/main server I played on. It was one of the first servers I joined and I hope it lives long. Sadly, I won't be returning because my love for survival has pretty much left. I will still come and visit every now and then and I might even join one day to give all my stuff away (better than it rotting in a chest forever). And if I ever really wanted to, I could return and start all over again. Even though I won't be playing on here anymore, I will always have amazing memories from this server and it would be awful if it had to be closed down V.V I hope the numbers increase and that Slap stays alive. And it is possible that if the numbers increase, old players that have left might return.